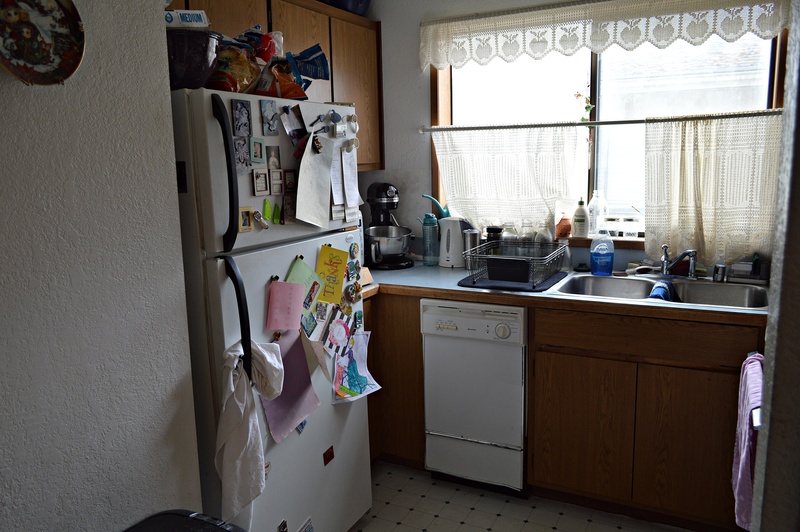 My teeny tiny kitchen, yes I can touch the stove and the refrigerator at the same time. Well it has to be magical to be able to cook, bake and decorate cakes in this teeny tiny kitchen. Don’t let a tiny kitchen stop you from creating, I try not to. I know, I’ve been off my game for months. I haven’t been doing much baking, no creative cooking and haven’t picked up a crochet hook in months! I haven’t been inspired by anything and haven’t felt like doing much either. 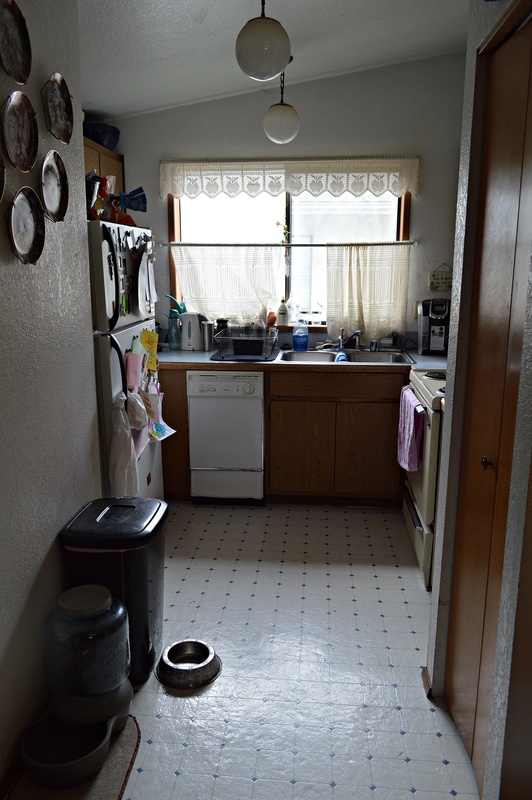 I am slowly trying to pull myself up by my bootstraps though, and I thought sharing some pictures of my kitchen with you all would be a great way to get myself back into blogging mode. I finally snapped a few pictures before the kitchen got messed up again. Trust me it doesn’t take long for that to happen. One batch of cookies, one sandwich and it’s a mess again. Yes indeed, I can touch the stove and the refrigerator at the same time. I guess it saves steps while I’m at the stove and just need to turn around, take two steps and I’m in the fridge. Doesn’t do much for my Fitbit step count though. Kind of hard to reach 10,000 steps when you only have to turn around and take one step to get anywhere. Not a lot of cabinet space either. Not a lot of prep space is there? The saving grace is a pull out cutting board. I use it as extra counter space. I have everything sitting at the back of the counter that I usually use, not enough drawers. Check out those drawers! They are ridiculously deep and have no dividers. For as deep as they are they probably could have added one more drawer. You can see my cast iron skillet and Dutch oven sit on my stove top all the time. I tried keeping them in the oven but I’m a flake and kept forgetting they were in there when I would turn on the oven. Besides, I use them all the time so why not leave them handy? Check out the lovely dishwasher. You can see the other side doesn’t have any more room than the other. My mixer sits in the back corner and when I pull it out to use there isn’t much room for anything else. The dishwasher is really nice and space saving too isn’t it? It is so little it’s only good for glasses, plates and silverware, which would be nice if it worked. I haven’t bothered having it looked at yet and just do dishes by hand. There is room on top of the cabinets so many of my big items that aren’t used very often sit up there. Unfortunately you have to dust them off every time you pull them out. Frankly I’d like to know what the designers/architects of this house were thinking. 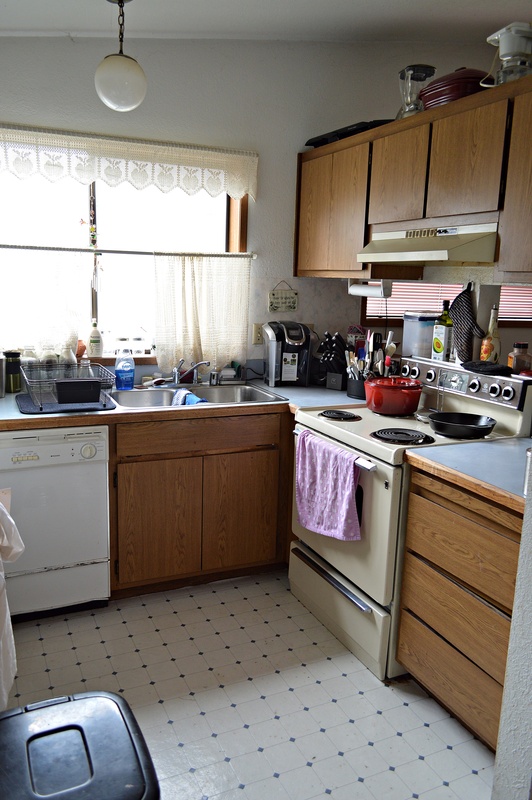 Around 1500 square feet and then this little kitchen? What, they think no one cooks? Fortunately it is only a rental and not my own. One of my first requirements for my first home will be a large open kitchen. How about you? Anyone have a smaller kitchen than this? I know they are out there, I lived in Germany for a few years and some of the kitchens there were a might tight. Mine is even smaller … the standard New York kitchen … the stove right next to the fridge with no space between them and no counter space. But I keep trying to cook and bake anyway though. Thanks for the reminder that I don’t have to have a perfect kitchen to feed myself well.